What is a good moveset for Hydreigon? If you have a good competitive moveset for Hydreigon, post an answer below and upvote the best ones. Movesets for any of its pre-evolutions can also be shared on this thread. Hydreigon Pokédex and learnset for reference. Just noticed none of these sets ( I think ) have coverage for fairy.... ^(•~•)^-----? sad that it got nerfed in gen 6, those darn fairies ! Hydreigon looks frightening. I think it may be OU since it can work as both Special or Physical sweeper (or mixed, courtesy of "Cheer Up"). Here is a good Physical moveset. EVs in Attack (obviously) and Speed. Choice Band would be a good item here for big Attack boost. Outrage: As many know I love this move. Predictable but a fantastic last resort if your opponent only has 1-2 pokemon left. Note sure about last slot yet. Earthquake covers a lot. I'll be interested to know how much Acrobat is boosted without items. Or something like Protect while holding Leftovers. Mine knows Crunch, Dragon Pulse, Focus blast and Rock Slide, and it works pretty well except Rock slide is only good with Rock Pokemon so I might give it Stone Edge instead. And I agree, I think Hydreigon will be the Lucario of Black and White. Mine knows Flamethrower, good move if you have to deal with a grass type, but otherwise Freeze shock has a great moveset. This guy is pretty nice, even comes with Levitate... which would have been perfect last generation, but now there are a bunch of mold breaker-like abilities. So this is my suggested set, as a mixed sweeper. Dragon Pulse/Draco Meteor - Good power, STAB. I prefer Draco Meteor since switching is so common in competitive battling, meaning the stat drops aren't much of an issue. Flamethrower/Stone Edge - Covers Ice and Bug Weakness. Plus, dragons aren't very cool without fire. Or stone edge if you want a LITTLE bit more power, and more of a physical movepool, but flamethrower's probably the better choice. Work Up/Hidden Power (Psychic or Flying)/Acrobat - Work Up boosts Both Attack and Special attack one stage. If you lean towards the mixed set, this one is better, otherwise go with Hidden Power. I'm not sure how much stronger Acrobat gets, but if it's anything significant, it could be a good choice to use in conjunction with a pinch berry. Dark Pulse/Crunch - Crunch is good if you want to be able to deal with physically and specially defensive Pokemon, but Dark Pulse comes off a higher special attack, your choice. For acrobatics give it a flying Gem, it triples the power. What would be a good EV array for this moveset? This guy actually doesn't seem as good as Ononokusu, and will likely be the equal of Dragonite. Not up to par with Salamence or Garchomp, not even Metagross, and of course not Tyranitar. Ability: Has to be Levitate, which is nice I admit. Earth Power: Ground has good type coverage. Five types fall to it. Dragon Pulse: Best Special Dragon move by far. Dark Pulse: Best Dark special move. Flamethrower: Deals with both Bug types and Ice types, who this guy is weak to. Trachy has a good point. Both Garchomp and Salamence have 130 and 135 attack respectively. Metagross with solid defenses, strong attack, and very widespread moveset. It is kind of a nice change to have a dragon that specializes in special attack, though. His special attack and speed may not be up to par with the other dominant dragons of the third and fourth generation, and the bulk of Tyranitar and Metagross, but his dark and dragon type combo, and his special attack focus can bring some different strategy as a dragon. I wish that you were able to have both earth power and dark pulse, but both are bred moves and are illegal together. If I could choose, I would choose the same moveset as trachy choose. Hydriegon is 1,000,000 times better than dragonite and 100 times better than metagross and garchomp. but almost as good as salamence and i would know from experience. That set is going to be possible in B/W2 thanks to move tutors! what do you mean dragonite is amazing!!!! Actually if garchomp tyranitar and metagross have megas ( besides garchomp's speed drop ) they outclass hydreigon by quite a lot . Metagross' stab priority and tyranitar's ability to break sturdy using weather damage ( ability )and entry hazards makes them more useful . Furthermore, multi scale dragonite has a great source for recovery,attacking,and it's abilities making it further more capable gives it more advantages and garchomp's speed can beat it in 1 hit , I don't see why you would judge the other pseudos like that . It's got pretty good attack stats, and 92/90/90 Defenses are extremely solid. However, if falls into the balanced pile of dragons. It has less bulk than Dragonite, but more than Flygon. It lacks the raw power of Salamence, but is still stronger than Altaria. I seriously think this Pokemon is being overhyped. It's better than UU Dragons, and has no definite Niche in OU. I think it's going to be OU, but then dropped to BL, because it can't compete with 'Chomp or Onono. Not sure if I agree with both Dragon Tail and U-Turn. With all of the new buffs we have in this Gen, you'll see why I included it. Yes I can see the use, but I think there could be better options. I myself would replace U-Turn for perhaps Cheer Up on this moveset, having Dark Pulse and Dragon Tail. Crunch and Outrage for STAB. This guy has 90's in his Defenses, So he probably won't be OHKO'd but taken down to a rather low Amount of HP Kicking in the Liechi Berry's attack boost. So it's somewhat similar to some of the other sets here but also a tad different. I have been using this Hydreigon set for a while now on all different teams and I have had devastating results. Draco Meteor is your main STAB and just tears down anything that is not a dedicated special wall or a steel type, and Dark Pulse is your secondary STAB, with a nice flinch chance. Fire Blast is coverage and hits the Steel types that threaten you (cough Scizor cough), and U-turn allows you to escape, revenge kill, and gain momentum for the team. Where did you get that awesome picture from? Well here is the set I use. I am going to get nailed for this, but it's a new idea. In my opinion, mixed sweepers is usually not good, but I think Hydreigon fits the role perfectly, especially with it's movepool. a bit of special attack, but it's Attack needs to be good enough to do damage. You could run something to take away some defense and increase speed like Hasty or Naive. Your choice. 252 speed is for outrunning Garchomp, and the 128 split is for bringing both it's Attack and Spec. Attack up to par. You would open with a couple of Work Up's(The mixed part of mixed sweeper is defined with this move), then use any moves. Acrobatics takes out Fighting and Bug, and Earthquake takes out Ice and Steel/Rock. Your call. Be sure to not equip an item if you run Acrobatics, as this will half the power. If you run Earthquake, you can equip life orb for some serious sweeping power on the physical side. After you Work Up, your next move is based on the type. Crunch takes out everything but Rock/Steel and Fight. That's where Earthquake/Acrobatics would come in. I would save Draco Meteor for when you really need it. You will get 1-2 good uses out of it. This set should take out pretty much anything. Please tell me what you think! 9/10 Garchomps in the Metagame Are Scarfed Outragers, who would take this thing down in a second. A good enough set. J98 brought up the main points here. One minor point left from me. Instead of using no item, you can use a Flying Gem. It will activate before Acrobatics' check for an item, meaning it will not only gain double-damage, but also the Flying Gem boost. Outrage is for STAB, and with the Band, it's incredible. Steel types don't survive long under this guy's pressure. Crunch is STAB. Rock Slide is for covering Bug and Ice types. U-turn is for switching, like a Banded Scizor using U-turn. That's actually where I got the idea. Some people might not like this because they say that Scarfed Chomp outruns it, but still, this Hydreigon can Sweep. < Hydreigon sez " Hi "
A mixed Hydreigon I thought of earlier today making use of the new BW2 move tutor teaching Superpower. His attacking stats are near equal, with the special attack peeking just a bit over the physical attack. 208 / 50 makes them equal. Life orb is for boosted power. While something like Lum berry can be nice, he needs the extra attacking strength when he's splitting up his attacking stats. Max speed so he can actually out speed stuff. Can't exactly scarf something with Work up. Dark pulse is your STAB that won't screw with your stats. 80 BP is pretty nice with STAB leading to a 120 BP attack. After 1 Work up this thing is at 602 special attack, so a simple STAB move that hits hard enough and doesn't worry with other jazz is nice. Superpower is physical and coverage. Fighting + Dark covers so much stuff. After using this once you're at +0 attack, so you can technically use it again if you must. Draco Meteor is your other STAB, only this one drops stats as well. 1 use is likely, although a second use is possible. You're probably going to be switching this thing in and out a lot anyway, so it's not too big of a deal. High BP is super nice. Work up generally works for stat boosts on both attacking stats. Now, the biggest thing you should remember when using this set..
STAY AWAY FROM SCIZOR!!!!!! -- Please... you'll get your Hydreigon fainted if you don't. Scizor counters this set in every way possible, BUT Hydreigon's ability to learn Flamethrower will normally scare Scizor off. Take advantage of Hydreigon's menacing presence to set up a substitute on a terrified foe, such as a utility Pokemon unable to hinder the beast behind a substitute, or an offensive Pokemon at the type disadvantage due to a choice item or poor coverage. The opponent will then switch in a check, a faster dragon maybe or other offensive threat, or quite possibly a powerful wall like heatran or tyranitar. Then proceed to obliterate the threat with attacks. Dragon Pulse is the mandatory STAB move, allowing hydreigon to dispose of its dragon brethren. Then comes the highly recommended fire type coverage. I'm not going to go into to much detail, but just be aware there are threats like Scizor where a miss could be fatal, and there are threats like Jirachi where more power would be extremely helpful. The final slot is a toss up, a matter of preference. Focus Blast is often the most used, as it severely injures Tyranitar and dents Heatran as well. However it is very inaccurate, and as such Earth Power may be the way to go, easily removing Heatran, but is not nearly as effective on Tyranitar. If you find that dragon/fire coverage us suitable, Roost may be used as a means of quick healing. A more bulky spread of say 252 hp 252 sp atk 4 sp def with a modest nature could be used. However, hydreigon would loose the crucial speed advantage over multiple prominent threats, including Haxorus, positive natured base 95s (like Kyurem B) and the neutral natured base 100s, most notably Jirachi. If you do a bulky spread, Roost is the preferable option for the fourth moveslot. EVs: 252 Speed, 252 SA, 4 HP. Charge Beam: Raising SA, While Doing Damage. Covers Water/Ice Types. Exactly what mine is, except instead of Dark Pulse i put in Focus Blast, as it gets more super effective hits. Then again, if i say this, taking out dragon pulse (for Focus Blast) and keeping Dark Pulse would be more effective. Sounds stupid taking out one of his main STAB moves, but with that moveset he hits 496 pokes for super effective damage. But i'm going to keep Dragon Pulse coz so many people i battle use dragon types. Well here is my Hydreigon's set up. Dragon Pulse- Coverage + You get STAB. Fire Blast/Flamethrower- For the sake of Coverage. Surf/Whatever you want- Not too many good moves he can learn, but I use him as a surfing tool, and Surf has come in many mighty situations, but it's probably not helpful on Double battles and whatnot since it'll hurt teammates. Substitute- You're pretty much promised to go first, so using this you can be wary and protect yourself. If they attempt using things such as hypnosis or status ailments, they'll all fail, and you'll slowly begin to regain the life you've lost from 'Leftovers'. Plus you're cautious, and if they miraculously have a move like Dragon Claw or Ice Beam that you didn't see coming from such a pokemon, then you've sacrificed only about 1/4th of your health, and you can switch out for someone else to Resist and or Defeat said Opponent's pokemon. Expert Belt bluffs the choice item, I decided since 10bp isnt much, HP Dark and Earthpower is better than Surf / Dark Pulse. The idea behind this is to paralyze faster threats, (i.e=terrakion and latios). 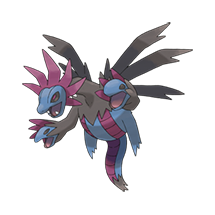 once parayzed, even if they are scarfed, hydreigon will outspeed. I suggest Flying Gem Item, as it will boost Acrobatics, be consumed, and not count as a held item when Acrobatics is actually used. Hasty nature is actually a great nature for a mixed hydreigon, as it boosts speed without lowering one of its attacking stats (it lowers defense. My question is why do people make Hydreigon a physical attacker? It's special attack is the highest of the pseudo-legendary Pokemon. Making it a physical attacker would be a waste, not just for being lower than it's special attack, but also because multiple pseudo-legendary Pokemon have higher physical attack. Re-edited: Fairy coverage is absolute garbage (as you would switch out if you don’t want to lose Hydreigon), and female gender because infatuation is annoying when you do come against it (as female Pokémon are more frequently used as the applicator). Info about EVs: I personally find that balancing the defensive stats, and maxing the higher attack stat (while raising HP or speed, or both or not at all depending on the Pokémon and it’s moveset), is useful in battles as people just max two stat’s EVs with them infrequently being a defense stat. Whoops, forgot that. It’s been awhile. 2 In 1 Hydreigon Question. What are good special moves I can teach my hydreigon? Is Outrage better or Dragon Pulse for Hydreigon in Black 2? Help find a replacement for Hydreigon!